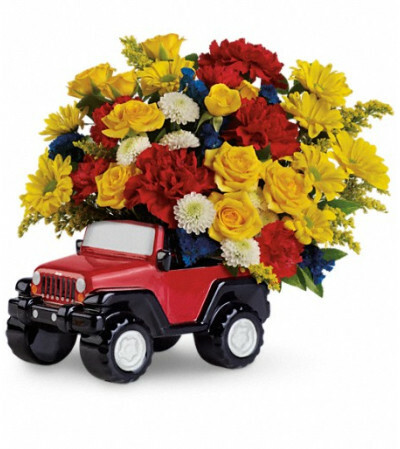 Make Dad "King of the Road" indoors as well as out with a cargo of bright flowers delivered in a ceramic replica of the classic Jeep® Wrangler. 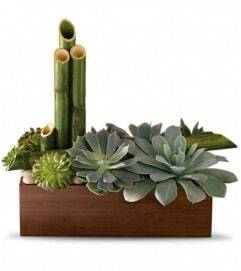 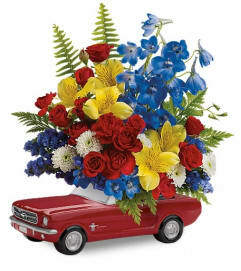 He'll get a huge kick out of this charming gift, and keep the sporty keepsake parked on his desk from now on. 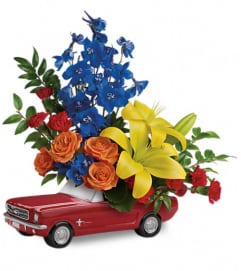 The bright bouquet includes yellow spray roses, red carnations, red miniature carnations, yellow daisy spray chrysanthemums, white button spray chrysanthemums and blue statice, accented with assorted greenery. Delivered in a ceramic replica of the Jeep® Wrangler.